Mexican American women have endured several layers of discrimination deriving from a strong patriarchal tradition and a difficult socioeconomic and cultural situation within the US ethnic and class organization. However, there have been groups of women who have defied their fates at different times and in diverse forms. 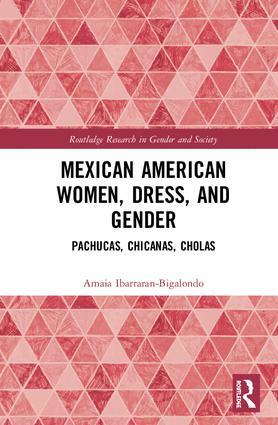 Mexican American Women, Dress, and Gender observes how Pachucas, Chicanas, and Cholas have used their body image (dress, hairstyle, and body language) as a political tool of deviation and attempts to measure the degree of intentionality in said oppositional stance. For this purpose and, claiming the sociological power of photographs as a representation of precise sociohistorical moments, this work analyzes several photographs of women of said groups; with the aim of proving the relevance of "other" body images in expressing gender and ethnic identification, or disidentification from the mainstream norm. Proposing a diachronic, comparative approach to young Mexican American women, this monograph will appeal to students and researchers interested in Chicano History, Race and Ethnic Studies, American History, Feminism, and Gender Studies. Amaia Ibarraran-Bigalondo is a lecturer at the University of the Basque Country, Spain.